The super-thick chain links in conjunction with U-lock are just impossible to cut with any manual bolt cutter. The cloth sleeve fades over time. No thief will be able to cut or open this lock! Offering the highest level of protection (10/10), it will provide you with the total peace of mind. 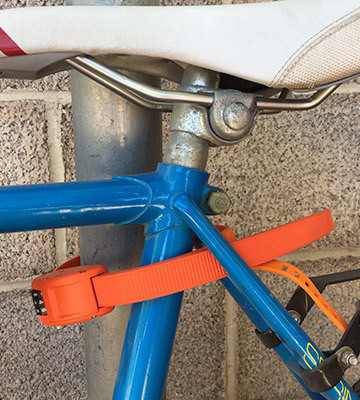 A velcro strap is provided with the U-lock to let you connect the cable to your bike frame. If secured to a frame, it adds reasonable weight to your bike while riding. 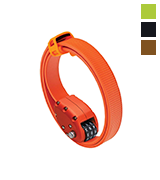 It's a heavy-duty U-lock with an extended diameter that would require additional force to cut. It can really give high-end locks run for their money. 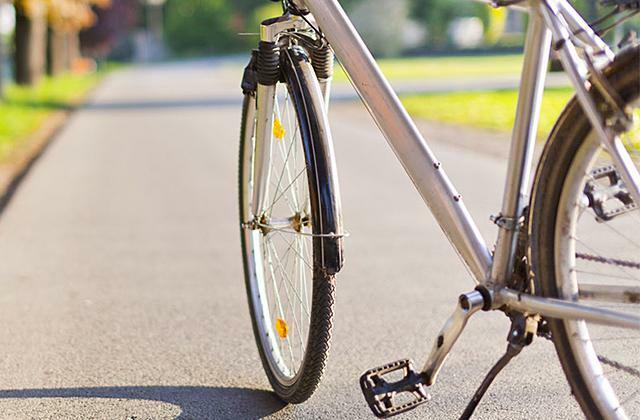 The cable lock is good for use not only on bicycles and some other vehicles but also on sports equipment, gates, BBQs, lawnmowers, and tools. The cable isn't very thick and can be cut with special tools. Titanker offers a lightweight and easy-to-use backup lock that can ensure some level of additional protection to your bike, ATV, or anything else you'd like to secure. The lock boasts the new “Pass-Thru” crossbar design that provides advanced protection against twist and single cut style attacks. Only 2 keys are included in the set. It's a Sold Secure certified lock (Gold rated) that offers a high level of security, which makes it great for use in high-theft areas. This cable lock is so lightweight and portable that you can keep it in your saddle bag, backpack, or even your pocket. The cable is rather thin and easy to cut through. This lock is good for cyclists and outdoor enthusiasts that need a super compact, lightweight solution for quick in and out stops. 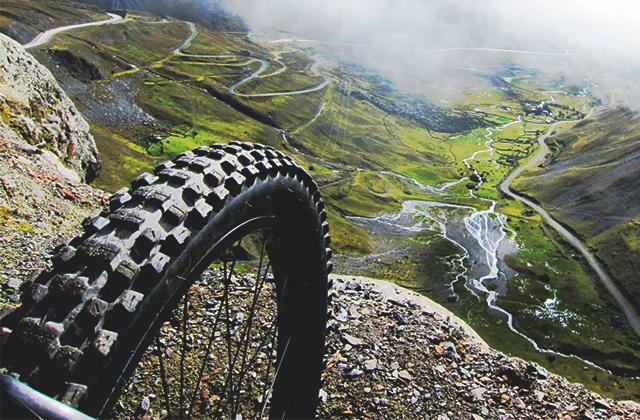 Kryptonite is a world-known company that produces high-quality security products for bicycles, motorcycles, snowmobiles, and other vehicles. 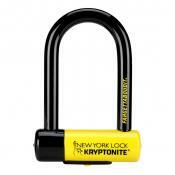 No wonder bike locks by Kryptonite are considered the most secure and reliable on the market today. 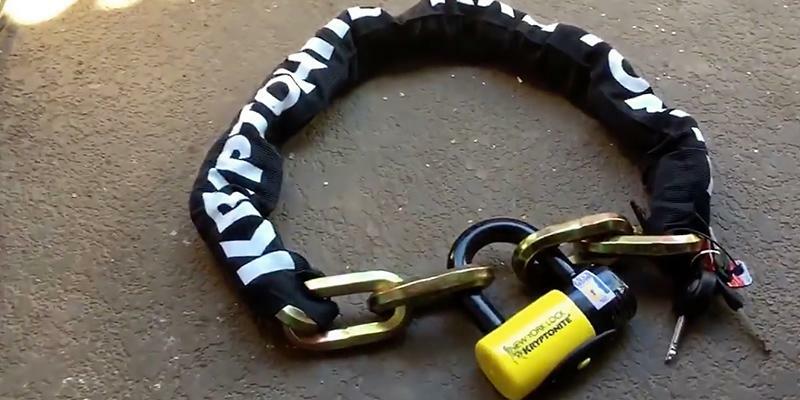 The very name of the lock - Fahgettaboudit - literally means that no thief will be able to damage or steal this lock, the hardened manganese steel chain links are totally uncuttable. To keep the lock look nice longer, the manufacturer paired it with a nylon cover to protect it from mechanical damage. So, if you don't want your lock to be scratched, make sure to use it every time. The kit includes three keys, one of which is lighted for comfortable use of the lock during nighttime. If needed, you can order more locks with a special program offered by Kryptonite. There are two options available - 5-inch and 3.25-inch locks, so you can choose the one that fits your bike best. 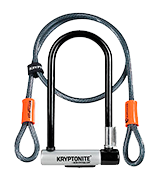 Admittedly, Kryptonite bike locks aren't the most portable locks on the market. With the weight of 10.8 lbs and 14 mm links, carrying them in your pocket won't be an option. Yet, they are not about portability. What they are designed for is providing security and that's where they definitely shine. Like all well-known brands, Kryptonite hasn't become successful overnight. It all started in the 1970s when Michael Zane invented a U-Lock and showed it to the world while traveling by car. The whole idea of traveling was to spread the message about the U-Lock and convince influential dealers to help produce it to mass. As a result, over the years Kryptonite has become a leading manufacturer of the anti-theft systems for two-wheeled vehicles. This chain can definitely protect you from thieves... as well as tanks and artillery. This thing is a beast! 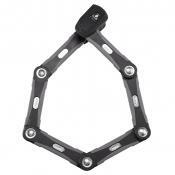 I think this chain would work best with my motorcycle rather than my bicycle. Probably an overkill for my bicycle but now I can rest knowing it won't be stolen during the night, they would have to bring down the building to take this guy out. The SIGTUNA Bike Lock is a great value given the quality vs. the cost. And it wouldn't be an exaggeration to say that this solid piece of protection can give much more expensive brands a run for their money. It's a heavy-duty lock that is a tough nut for bike thieves. Designed with extra-thick 16mm bars manufactured from specially-hardened steel, it offers excellent protection from the most determined of attacks. It can withstand hammers, saws, drills, cutting disks and even bolt croppers with just minor nicks left afterward. A locking mechanism uses a double-lock design which offers greater protection, while the picking-resistant precision locking cylinder ensures extra security against attempts at manipulation. The lock has deservedly earned a top score of 8/10 in the SIGTUNA Security Level System. For extra flexibility, the U-lock comes with a 1200mm steel cable to let you use the locking system on a lot of poles and fences. Plus, it gives you the privilege to lock different elements of your bike at once. 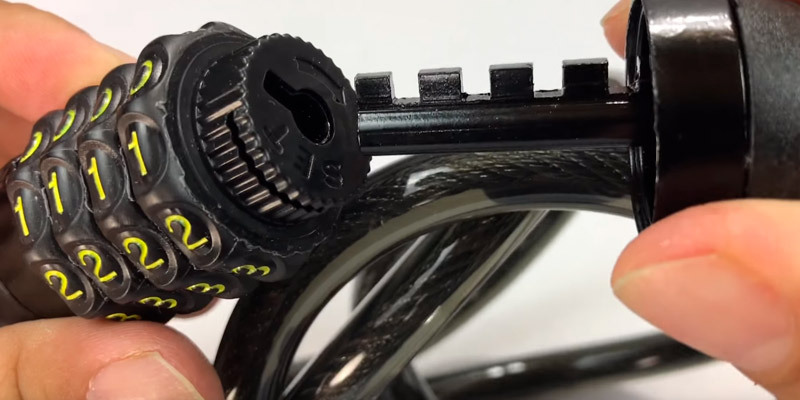 For example, the primary U-lock can go through the back wheel of your bike (inside the rear triangle of the frame) to secure it to something solid, while the cable can lock the front wheel. Also, the combo of the large U-lock and the 1200mm chain makes it possible to lock two mountain bikes at once. The good news is that the manufacturer provides not two but three keys with the purchase. So even if you somehow lose one, you'll still have a second reserve one. Another extra accessory included in the kit is the SIGTUNA Mounting Bracket. 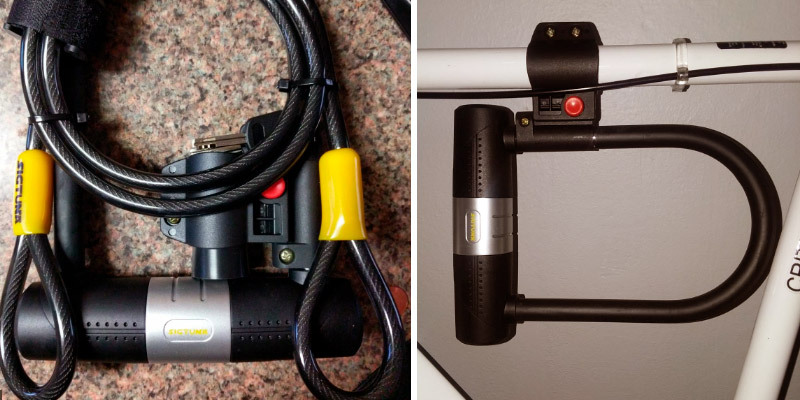 Since every bike is different and some might lack space within the frame to fit a bike lock, the additional mounting bracket allows you to secure the lock outside of your bike frame (triangle). It's really easy to mount and remove it with a push of a button - once you hear the click, you are good to go. Last but not least, the lock is provided with a velcro strap that lets you connect the cable to your bike frame. If you wish, you can secure bags and other valuables to the cable for convenient transportation. 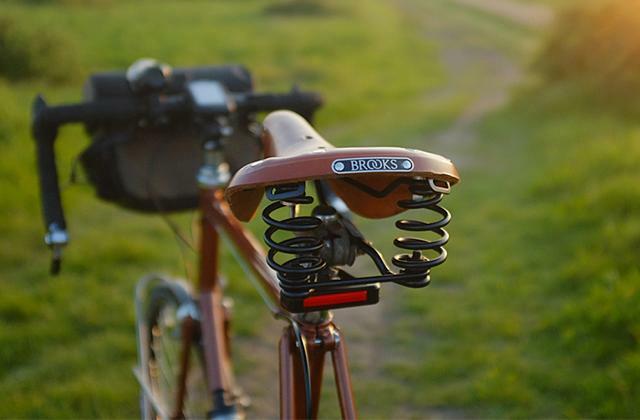 The only thing you may dislike about the lock is that it adds some weight to your bike. But we believe that the security of 16mm steel is worth the little bit of extra weight. 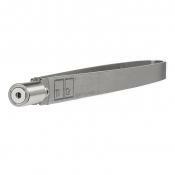 It's a heavy-duty U-lock with an extended diameter that would require additional force to cut. It appears to be very solid and able to prevent theft in high-risk areas. 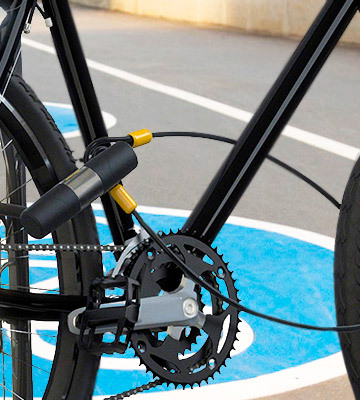 The u-bolt is very solid and the cable long enough to secure the bike. I carry it in a backpack and weight is not a big problem. Very thick and durable plus easy to attach and use. I have no concerns my bike will be stolen now! Comes with a cable too so I can lock up the wife's bike also! Need an affordable backup lock for your property? 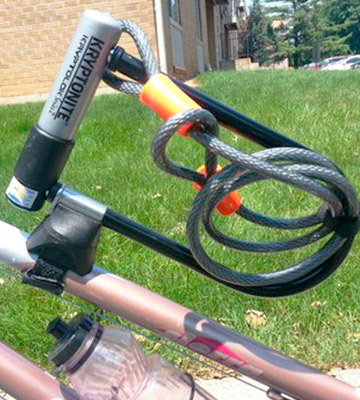 If so, you should seriously consider the Titanker Bike Lock. For nearly $10, you can get a decent cable with a reliable 4-digit combination locking mechanism. 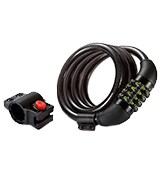 The cable is made of high-quality steel and covered with PVC coating that prevents any possible scratches on your vehicle and makes the lock a bit more durable. However, it's important to point out that it isn't as thick as the one used on higher-end models and less strong too, though it doesn't stop it from protecting your bike. Besides, a bike with a lock is still way safer than a bike without one. Further on, thinner cables mean lighter weight. 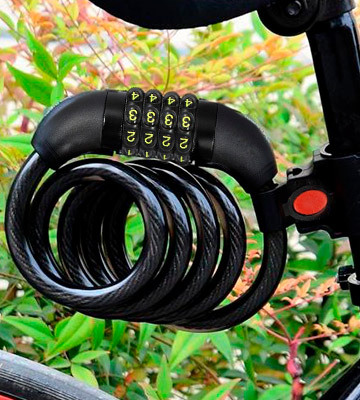 The Titanker Bike Lock isn't as hefty as other locks on the list, which makes it suitable for use not only on bicycles and other types of vehicles but sports equipment, gates, fences, BBQs, lawnmowers, tools, storage sheds, ladders, and similar items as well. Finally, the lock is very easy to install. 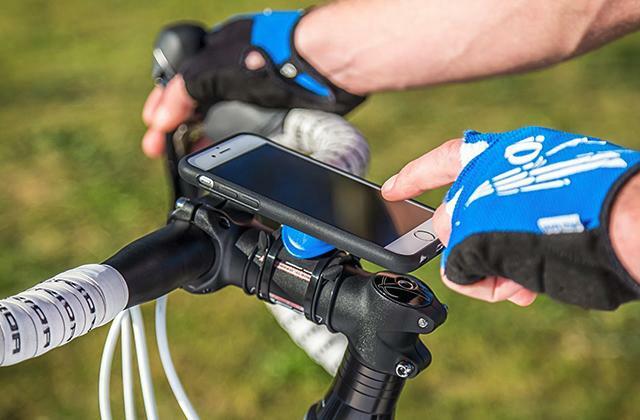 The package includes a mounting bracket that attaches to your bike seat post or frame post. It uses an easy-to-release attachment mechanism, letting you hook the cable neatly when it is not in use. 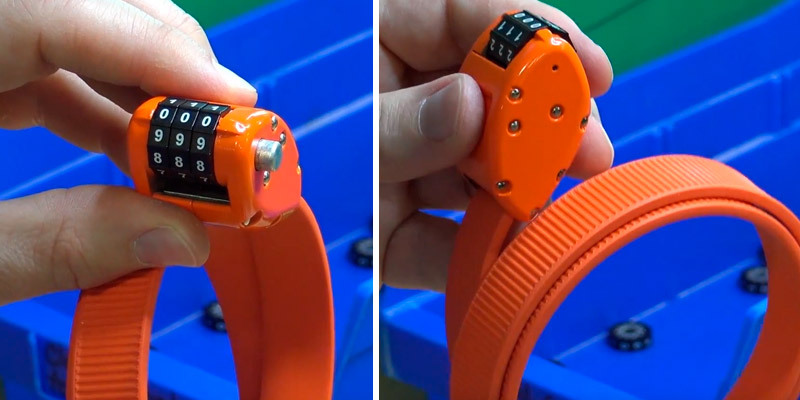 This multipurpose 4-digit lock allows for 10,000 combinations, which makes it nearly impossible to crack. However, the complicated mechanism is fairly easy to set up for users. Set the combination wheels to 0000. The default code must be aligned to the line with two bumps. Rotate the set/reset knob, keeping the default password. Open the lock. Turn the dial wheels to your preferred combination, making sure that all the numbers match the pointer. As soon as you set your personal digital combination, turn the knob back to its original position (90 degrees left). You're done. The new combination is chosen. To sum it all up, if you need a lightweight and easy-to-use combination lock, this one can be a good choice. Though a bit thinner than some other locks we've reviewed here, it is strong enough to ensure the needed level of protection to your bike, ATV, or anything else that you want to secure. 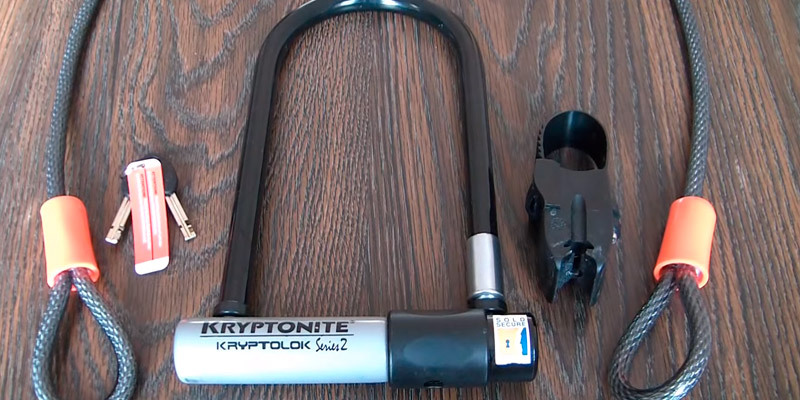 As mentioned, Kryptonite is a big name in the industry of security accessories for bikes. Kryptonite stands behind product quality and service, so you can be sure you're getting one of the sturdiest locks on the market. And to understand how reliable the lock is, just consider the fact that Kryptonite will pay you out certain value in case it's somehow defeated. The only requirement from the manufacturer is to register your product online. Another perk you get upon registration is the free delivery of spare keys in case of loss. It's worth emphasizing that the "Key safe" program covers only the first keys included in the package. By the way, the lock comes with 2 keys that have an ergonomic design to reduce the amount of torque and prevent the breakage. The box also includes the patented Flexframe-U mounting bracket. It's fairly versatile and can be mounted on any part of the frame, providing a hassle-free fitting and convenient location of the lock. 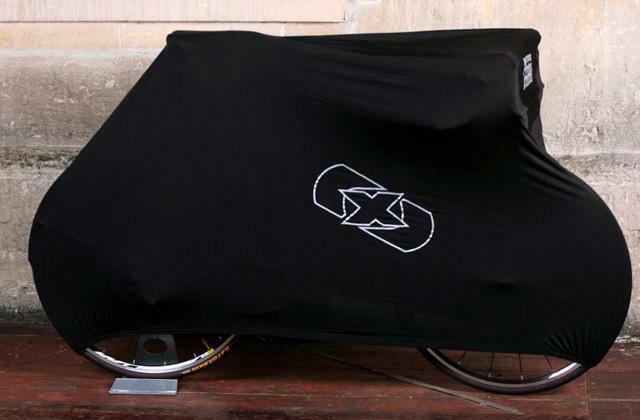 The D-lock itself is supplied nicely wrapped into a dustcover. 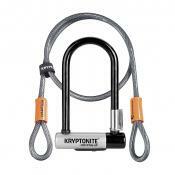 The Kryptolok is a heavy-duty shackle bike lock with the added protection of a 4-foot double-loop chain. But the cable, in our opinion, is a bit too short to go through the bike frame, wheel, and rack. For that extra security, a longer cable is required. 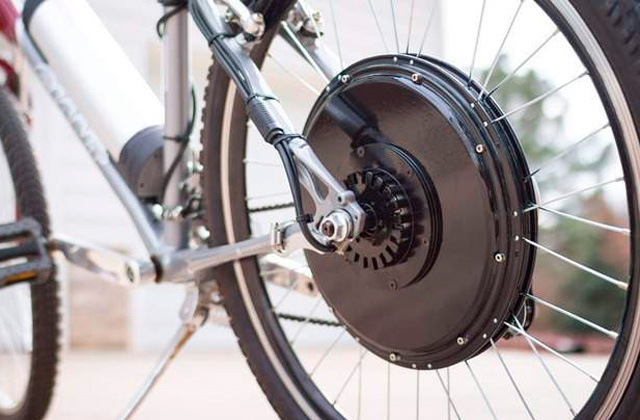 Still, the braided steel cable can secure a front wheel or the rear triangle of the frame. And since it's wrapped in a protective vinyl coating, it won't scratch anything. 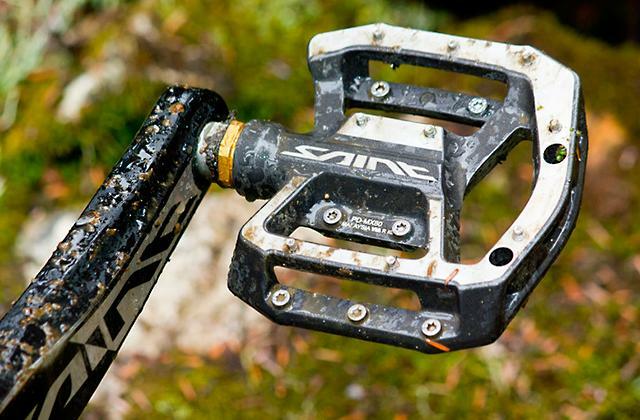 The D-lock itself appears to be pretty indestructible. It's made with 12.7mm hardened performance steel shackle and boasts the patented “Pass-Thru” design. This new design offers enhanced protection against cut and twist attacks. Meanwhile, a high-security disc-style cylinder offers even more protection with its pick and drill resistant properties. What is notable, the core boasts a special protective mechanism that prevents dirt and dust from getting inside. This not only prolongs the life of the lock but also minimizes the risk of a key sticking inside. To conclude, it's a Sold Secure certified lock that is gold rated. 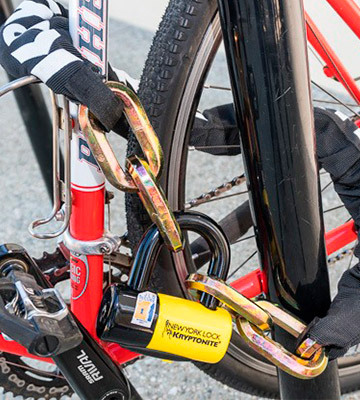 Gold-rated locks are proved to “offer the highest level of security”, so you can be sure you're getting an effective bike lock suitable for use in high-theft areas. 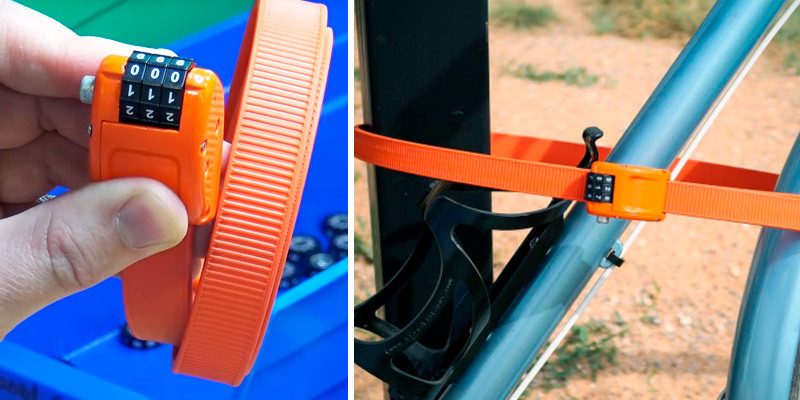 In case you're looking for something ultralight to carry in your pocket or saddlebag rather than on special mounting brackets, we have included the OTTOLOCK Steel & Kevlar Combination Bike Lock in our list. 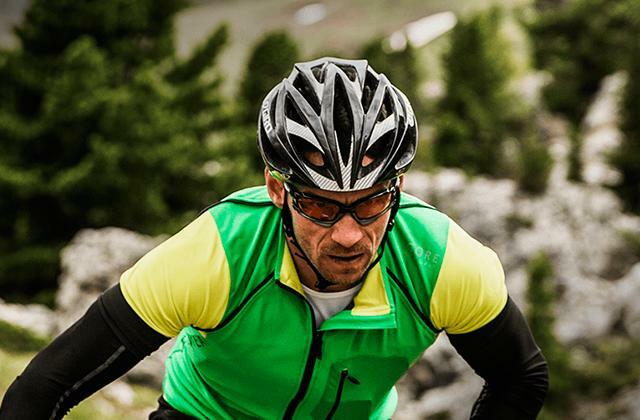 The lock is designed especially for those cyclists and outdoor enthusiasts that tend to travel light and need a super compact, lightweight solution for quick in and out stops. The cable has a multi-layer rugged construction with the combo of stainless steel and Kevlar inside and anti-scratch Santoprene plastic outside. But frankly speaking, the cable isn't supposed to stand up to professional devices that thieves usually use. 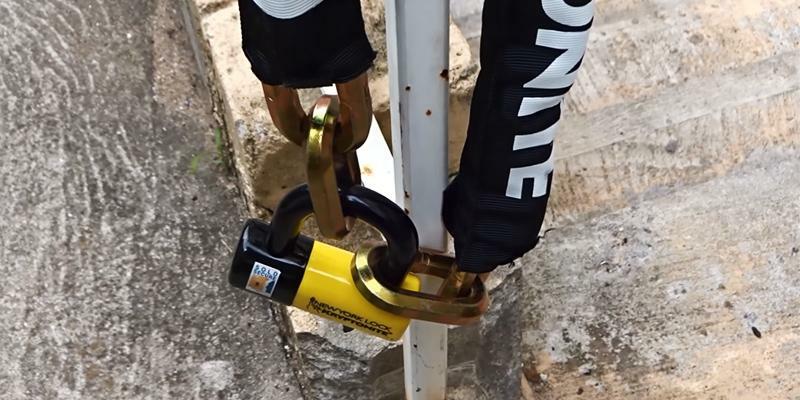 A bolt cutter is able to cut it off in approximately five minutes, so we wouldn't recommend using the lock for securing your bike overnight somewhere. The OTTOLOCK lock is good for short-stay security against theft opportunists. It's a good option for locking up your bicycle while you're exercising at the gym or grabbing lunch in a low-risk area, for example. This simple digit lock is available in several length options to suit most travel needs. Naturally, the weight varies with each modification, starting at 0.4 lbs for the shortest 18-inch cable. The shortest 18-inch model offers somehow limited reach and is best for weight-minded users. It can tie single bike tubes to posts. If the object isn't too big, it should fit nice and snug. This type fits easily into a jersey pocket. The 30-inch lock is the most versatile length. It offers virtually the same amount of portability with little-to-no weight trade-off. The medium-size lock will easily fit inside of a small backpack or your pocket if you roll the lock up. 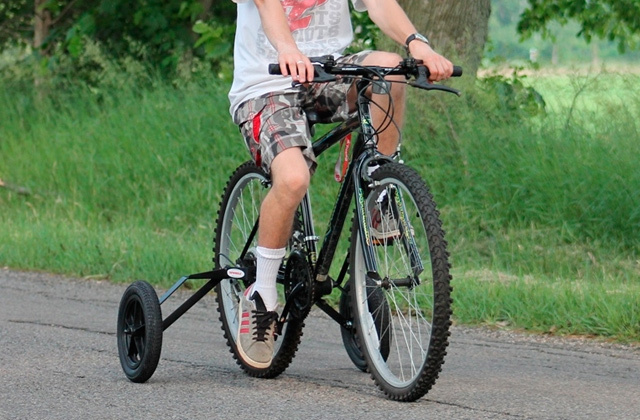 Yet, it's long enough to secure a frame and wheel to an outdoor bike rack. 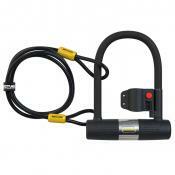 The largest, 60-inch lock is the best option for securing multiple bikes and car/truck racks. Each of these options can also find many other outdoor uses. 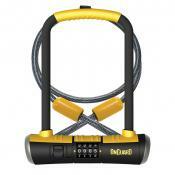 For instance, you can secure camping gear, canoes, coolers, construction tools, and similar stuff using the OTTOLOCK. It provides good short-stay security for just everything you can tie around. What Is a Bike Lock? Safety comes first, especially when it comes to the protection of your vehicles. A mind-boggling fact is that more than 1.5 million bicycles are stolen each year. And the best precaution against theft is buying a reliable bike lock. Today, bike locks come in a wide variety of styles and shapes. 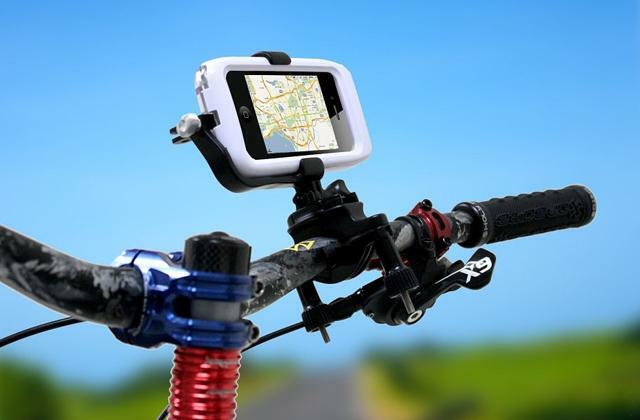 To understand which one will suit your bike it is important to measure your bike and check what installation options are available. If you see that it's enough to secure only one wheel with a frame, you can safely opt for a simple U-lock. 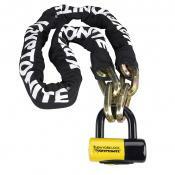 In case you seek a bit longer reach, though, we recommend you consider a lock with a chain. For this review, we have rounded up the strongest locks that can cater to any need and type of bike. They have undergone expert testing and have been proven to be very effective and secure. So, by choosing one, you can have a piece of mind, knowing that your two-wheeler is well-protected while you're away. 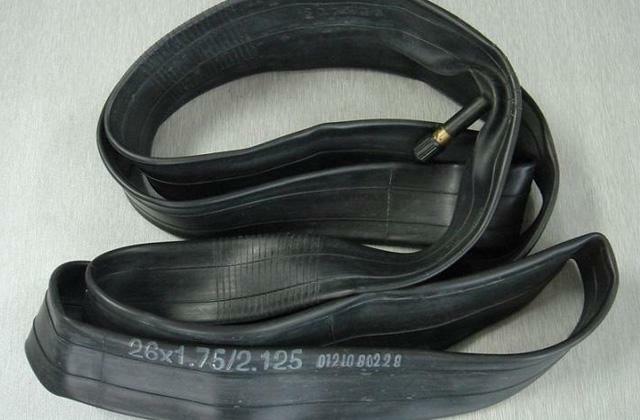 In addition, we recommend you to consider top-quality bike pumps for a comfortable and hassle-free ride. 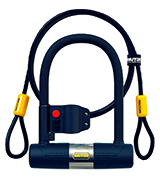 Today the market offers a great number of bicycle locks with different protection levels. So, to choose the right lock, you need to decide what level of protection you actually need. U-Locks are the most secure and theft-proof locks on the market. They are made of uncuttable materials and are very convenient to use. 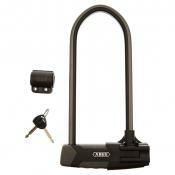 U-Locks come in various sizes, yet, you should choose the rigid one that will sit tightly on your frame. U-locks are perfect for high-risk areas. 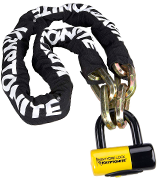 Chain Locks are also considered to be super secure anti-theft equipment. No wonder, they are recommended for use in areas with high crime rates. However, their reliability often depends on the type of steel, the thickness, and the overall lock quality. 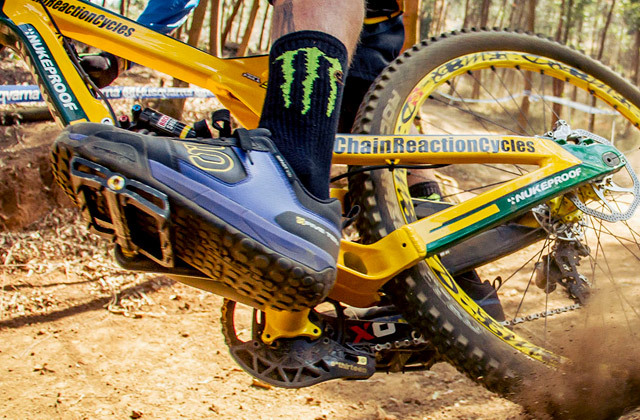 Cable Locks are a more versatile option, but not the most reliable. Yes, they are fairly lightweight, compact enough, easy-to-use, also they might be cheap, though, they offer very little security. Thus, for greater reliability, they are often combined with U-Locks. Generally, cable locks are recommended for use in low-risk areas. Folding Locks consist of linked metal plates. Hence, they can be folded compact for transportation. Also, they are not heavy, and like U-locks, they offer a great level of security. 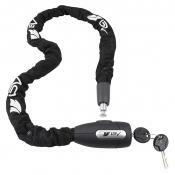 Plus, they are pretty flexible, which means that you'll get more options on how to lock your bike. Wheel Cuffs Locks. Such locks resemble cuffs, one end of which should be fixed to the frame, while the other fixed to the rim, thus blocking the movement of the bicycle. 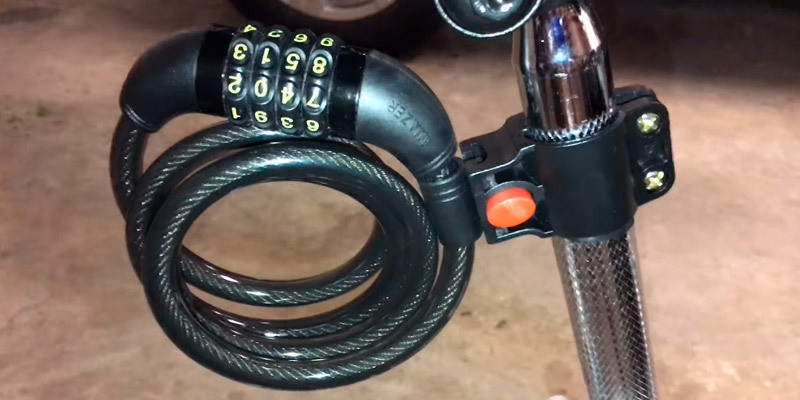 However, the wheel lock does not prevent thieves from carrying a bike in their hands, so this type of lock is not recommended as the only secure lock. Locking skewers for Seats. They work in a great number of ways. For example, some of them use non-standard keys, while others can use gravity to lock the levers. All of the mentioned locks are most common, however, nowadays you can find locks that do not fit into any category. In addition, the locks may have a key or code mechanism. Here the choice depends on your taste, whether you prefer using a key or a code combination. As it was mentioned above, bicycle safety depends on the material. Make sure that the lock has been manufactured from high-quality steel. It will be much more difficult for thieves to cut strong and thick steel. Also, pay attention to the set. It will be great if a lock comes with a few keys and protective pouch. As a rule, the weight is often directly proportional to the reliability. We mean that a strong thick steel lock can weigh quite a lot but boasts a great level of protection. Therefore, you need to decide whether you need a light portable (< 12 mm) lock or heavier and more reliable one (> 12 mm). 1. Rylee Sweeney How to Choose the Best Bike Lock, OutdoorGearLab. March 11, 2015. 2. Bike Locks: How to Choose, REI. 3. 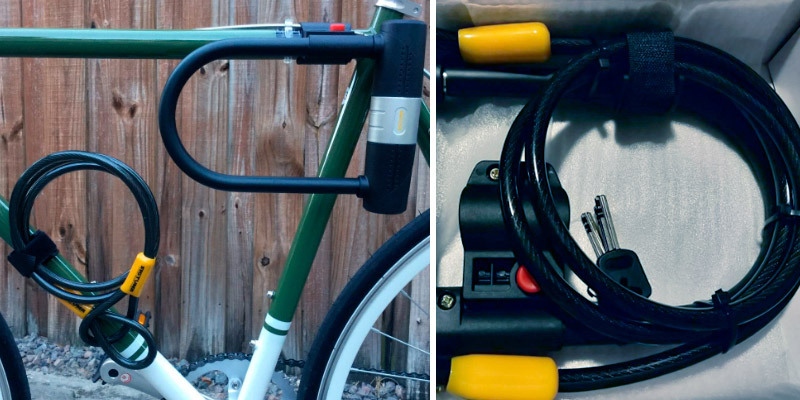 Bike locks buying guide, Wiggle. 4. 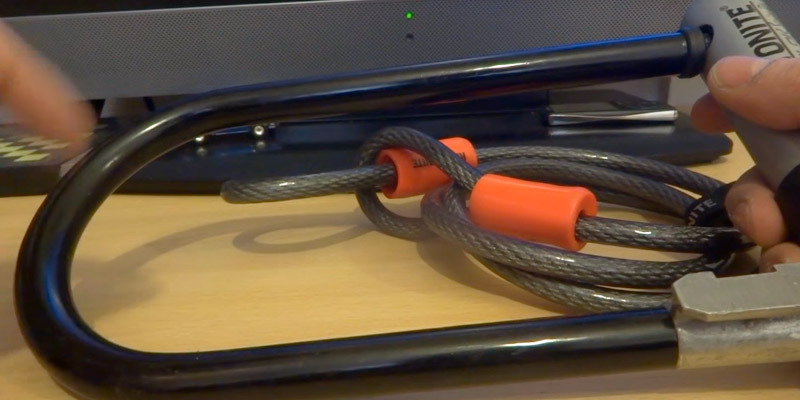 Paul Smith & Warren Rossiter Buyer's guide to bike locks - video, BikeRadar. July 23, 2014. 5. How to Choose a Bike Lock, EASTERN MOUNTAIN SPORTS. 6. Bike thief tells how to stop your cycle from being stolen, The Guardian. 7. Kryptonite Company History, Kryptonite. 8. Mikael Colville-Andersen The 20 Most Bike-Friendly Cities on the Planet, Wired.